Abdulkareem 13, weighs 31 kg. At different times, daily, he goes to fetch water for the family's use, carrying a 20-litre bucket. When filled to the level he feels comfortable carrying, it weighs 15kg. For the youngster who lives in an uncompleted building in with his father, stepmother and three siblings at Dawaki Extension of the Federal Capital Territory, he said, "The thing I want the most is to live in a house with running water." "I am tired of the headache and tiredness I feel fetching water. I know I cannot go to school, but I don't want to spend every day fetching water," he said. Saratu Mohammed, nine, is a resident of Paikon Kore, a community of about 10, 000 inhabitants in Gwagwalada Area Council of the Federal capital Territory. She, along with her brothers, Ibrahim, seven, and Kabiru, 11, go to River Eku to fetch water for their family's use. On school days, it is a chore they carry out from 6.30am for at least 30 minutes before preparing for school. On weekends, they don't make the trips as much because most women, including their mother, go to the river to do their washing. In commemoration of the 2017 World Water Day, UNICEF warned that one in four children will live with water scarcity by 2040. The United Nations children's agency anticipates that nearly 600 million children in the world will be living in areas of extremely high-water stress within the next two decades with the poorest and most disadvantaged, bearing the brunt. He said, "They are growing and most of their ligaments, joints, muscles and bones are undergoing tremendous adaptation due to growth hormones modulated by the effect of external forces." "A growing child," Kawu said, "has a unique centre of gravity which is constantly changing due to growth and the effect of the load may temporarily alter this dynamic ball and on a projected scale may permanently alter this." On the defects Saratu and other children like her are exposed to, Kawu said they range from kyphosis scoliosis which is a condition where the spine is bent forward and sideways. "This deforms the person physically and bruises his or her self-esteem as I have seen with children I have treated." With no less than 20 percent of patients in his care being children with back problems, the spine expert said, "Even if they [children] develop degenerative problems later in life in the spine, we won't be able to tell the origin because we have not done any study in this part of the world in this regard. 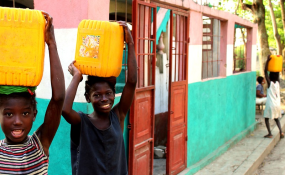 It would be difficult to tell later in their lives, if any of these children developed a back or spine problem as a result of water fetching and carrying these heavy containers as frequently as they currently do." A current problem with making the right diagnosis with children who suffer back pain is that parents are not entirely honest about their children's routine and the kind of chores or tasks they are subjected to. "Most of the children I see with back problems are from disadvantaged backgrounds. When they come, I look out for tell-tale signs of abuse, especially from beatings by their parents and I sometimes see them. They also fight at the stream and pumps from where they fetch water and get injured in the process," he said. He added that, "Since we have not done any study to determine the maximum load allowable on the head of a child, it is safe to presume that carrying load and such weights on the head by growing children, should be discouraged at all levels." And as long as these statistics remain this low, it is not likely that Abdulkareem's desires will come to pass anytime soon. It is also most unlikely that his back and shoulders, like those of Saratu and her siblings, will be getting the much-needed rest prescribed for them.